Students and guests started forming a line in front of Jerome Richfield on Saturday around 2:30 p.m. for CSUN’s 10th Big Show. “We’re the smart people,” said Matt Dibo, 20, a fire technology major from College of the Canyons who came with a CSUN student. Dibo, who was the first of the students allowed in and he cracked a big smile when a security guard motioned him forward. Security guards used wands and metal detectors to prevent weapons and other unwanted items at the concert. They also checked purses and threw away lip balms, eye drops and lip gloss because they thought it posed a security threat, which might allow students or guests to sneak narcotics into the concert. One of the Big Show rules was that minors had to be accompanied by an adult but security had no way of verifying there was an adult present for every group, said Pedro Bernardino, 20, volunteer at the Big Show. While some students were going through the metal detectors, other students were purchasing sodas in half-liter glass bottles from the Munchie Machine, one of the vendors at the concerts. There was a booth selling glow wear and all of the proceeds earned from the booth were going to an organization called Autism Speaks. “SPACE bought them with the budget and whatever money we collect from the glow bracelets and glasses will go to the relief fund of autism,” said sophomore Raumika Nayyar, business management major. By the middle of the night the Autism Speaks booth had sold out all of its glow glasses. Czarina Martinez, graduate assistant for student production and campus entertainment (SPACE), which was the organization that spearheaded the concert, said LMFAO and Kevin Rudolf were spotted early that day doing sound checks on stage. “For sound check, artists don’t usually show up, so it was surprising that both artists did,” Martinez said. CSUN provided the artists with their own hospitality rooms decorated in drapes and items they requested to have within them, Martinez said. “It (the hospitality room) is a nice area to make them remember CSUN treated them well,” Martinez said. LMFAO was paid $40,000 to perform, said Ali Garcia, executive director of SPACE. LMFAO sang their song “Put That A** to Work” for the first time in L.A. County and shortly after, one of the members, SkyBlu, brought his father out on stage for his birthday and had the crowd sing “Happy Birthday” to him. Chieko Shioi, 22, an international student from Japan and kinesiology major at CSUN, said she thought LMFAO was cool. “It makes me wild and I enjoy the music,” Shioi said. Shioi added the $5 were worth it. put on a great show!!!!!!!! there fans a great show!!!! I had the time of my life, no doubt. I could care less about the lines, that’s how it always is for venues. The performances were great, the people were great and that to me is what made the experience most memorable. very disappointing experience!!!!!! there was a lack of security for the amount of people waiting in line. there was a large crowd waiting to get into the venue and it took two hours after being in line that i actually got in. it took very long because their was a lack of organization, there were only three securities (mind you that there were two that were standing next to each other and when i approach them both telling them people were cutting in and was getting out of hand outside they did nothing as i was their. I asked them to use their radios to ask for more people to come assist them they said they all ready had several times. 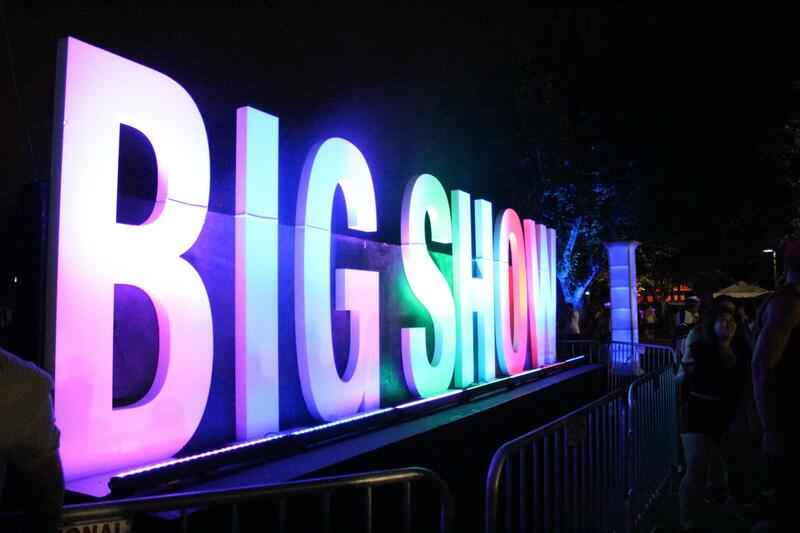 Safety should always be a priority and the organizers of this event “the Big Show 10” did not have enough securities outside the venue controlling the lines. Nice! there were metal detectors as you were to walk into the event what about before? people get crazy when intoxicated, there were plenty intoxicated people in line trying to cut-in others cutting in and others trying to pee behind the bushes. Safety should have been a priority for this event specially when organizers expect a large amount of attendees. No accidents i saw, but it could have easily happened because of the lack of safety outside in line. For next time Sig Show organizers, safety is a priority. If something were to happen you would be at fault for not having enough security. For my experience of planning, last Saturdays event should have had at least 30 people handling the lines. would i attend another big show event? NEVER!!!!!! I got in line early and had a very different, pleasant experience. I had fun. And I don’t think you should let your experience in the line effect your decision to attend other Big Shows. You were there for the show, I assume, not your experience in line. I think if you had left your negative energy at the door (or at the metal detector in this case) you could have had a great time.